Perhaps you've read the story in the New York Times this week about bartenders, restaurant workers and alcoholism. Good piece on a worthy topic. But the logic behind this story appearing in the Dining section devoted to "Summer Drinks" escapes me. What's that? Alcohol is a drug with serious and widespread side effects on all society, especially restaurant workers, and their struggle deserves attention and acknowledgment? Then it should get better exposure than this section (scrutinized each week by restaurant owners, publicists, recipe hunters, food trendoids and, well, people like you and me) gets. But it was reported by a food section's regular writer, which makes the story's arrival appear to be someone's idea of counter-balancing all this talk about festive and serious modern drinking with some stern lessons in the wisdom of sobreity. Was a recent collection of barbecue stories accompanied by a piece explaining the link between charred meat and cancer? Will the next piece in the Times covering wild food foraging highlight the Center for Disease Control's annual body count of pickers mistaking a poison toadstool for something toothsome? I searched the words "chef" and "diabetes" on the Times site just to see if I was being too sensitive, and the most recent complete article I found dates from late 2001, a serious account of a chef who had to leave his pastry craft behind when developing the disease. But nothing more current about the risks chefs run in developing or managing the problems of diabetes. So I tried "heart disease" and "chef" and got mostly obits. But surely the level of diabetes, heart disease and other weight related illnesses is high among professional cooks? When's the last time the section ran a piece about the battle chefs face in weight control, hyper-tension, diabetes, cholesterol, or about heart disease rates among food service professionals? Leave aside the activities of Alice Waters and others promoting better eating habits and NYC's trans-fat ban and the coverage devoted to health-related topics, especially regarding restaurant employees, shrinks to near-invisible. It's not news that there's a strong strain of puritanism among Americans and especially journalists, and a tendency to allow the worst define the whole. And I'm not arguing that the causes and effects of alcoholism don't deserve serious coverage - nor that the strength displayed by those folks who continue to work in booze-drenched environments (like the great Harry Denton and Pegu Club's Del Pedro) while remaining sober aren't to be celebrated. (I didn't drink at all during my last 18 months as a bartender, an experience that sobered me in an unanticipated way and sped my departure from behind the bar and ultimately from service.) 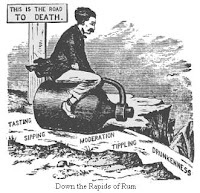 But I am saying that, of the many pleasures that can become habits and habits, addictions, it's the enjoyment of alcohol that seems most likely to fall under scrutiny in the modern nanny state and to be blamed for the ills misuse cause. The juxtaposition of the "Guide to Bartending" and "Mixing Drinks with Work and Staying Sober" in Wednesday's Times was just the latest example. Meanwhile, I await the sidebar on the dangers of sharp implements and chronic cutting among chefs to accompany the "Dining" section's next knife guide.